Lots of wires; how to run and connect them all. This page describes some of the things I did and the tools I used in getting everything in place. 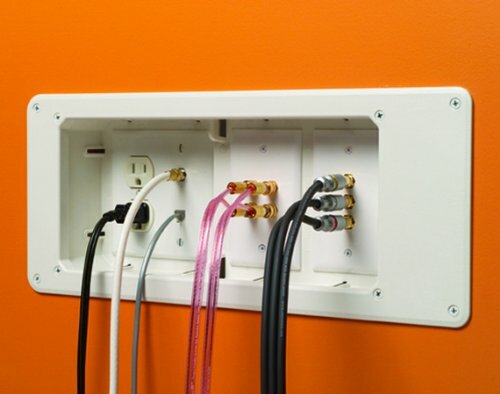 Start with a floor plan and mark all the locations where you want the specific outlets. I drew out all the places where I had drops, so I could visualize the drop and was sure I had everything covered. Here is the drawing file I used. Almost all new home electronics have a network connection - TVs, BluRay players, AV receiver, Satellite decoder, security system, game systems. Don't forget to extra dedicated drops for these devices. If you are doing a big reno with other electrical permits being pulled - Get your LV wiring permit from your city office! I found that there were a couple of hub locations that had many devices. Pull an extra Cat5 and 2-pair security to give you a bit of flexibility to adjust. I ran 12V that will be powered from a UPS - don't forget to run a drop to your cordless phone so it works when the power is out! Expect to move things around because of things like wall studs in the wrong place, lights or existing wiring. Keep the electrical guys away from your media closet. On the 1st day I talked to the electrical guy and told him he could run his 120V wires anywhere he wants but stay away from the 1mx1m closet where all my wires would be terminating. Get a low profile drill or a 90 degree drill to fit into tight joist locations. I bought something like this. It did the job but BEWARE, it just barely lasted. It is very loose and feels like it is ready to fall apart after a weeks use. Battery powered drills won't do the job drilling holes in the joists for your cable. My house has 2nd growth Douglas fir from the 50s that is very hard. (This is a good thing for a solid house, but no so good for drilling holes.) I used a good 1/2 hp drill (most aren't 1/2 hp). The electrical guy had an industrial size drill with a long auger bit that worked really well. Use auger bits. they just work better. Mark your cables. I had a few Sharpies that I would write the drop location at the start of the cable. ALSO, mark the box number if you are pulling more than one of the same type of cable. If you have runs where you are pulling multiple runs of the same cable type.... buy at least two boxes of that type of cable so you can pull both runs at the same time. For example, many locations had 2 coax outlets in the same drop location so having 2 boxes of coax cable allowed me to pull through the joists only once. If you know you are going to have many cables heading to a specific location - drill a bigger hole. In some places, I drilled 4 - 1 3/4 inch holes all at the same time so I would not have to go back and drill - I just had to pull wire. Don't drill the holes too close together - you don't want to damage the integrity of the the joist. It took about 1 or 2 hours to do one cable pull. That included figuring out where to run the cable, drilling and the pull. Many took longer. Some I had to re-pull because they were in the way or I changed my plan. Did I mention- mark your cables. I can easily see getting mixed up when there are hundreds of cables hanging down in one room. If you want to save time and money - I strongly suggest doing some preliminary thinking about what want, going where, and shared with what other outlets. I was going to be "just one of the trades" working away in the basement with a fixed timeline and I did not want to get in the way, and I did not have time to run out to the store to buy "this and that" every time I ran out or found something I needed. I had everything ready to go before I started. I knew I would have a few places where the LV wall outlets would need to be shared with the 120V electrical outlets, so I had to go out and find the right boxes to use. This is not as easy as it might seem. I ran into problems "sourcing" the boxes from Canadian dealers at reasonable prices. Take note: big-box stores (Rona and Home Depot) do not have anything other than the basic single gang LV boxes. I visited a few electrical wholesalers that barely gave me the time of day, so I had to know exactly what I needed from them. I ended up with some Carlon boxes & rings, a few 2 gang and 4 gang Arlignton Industries recessed media outlet boxes. In the media closet, where I home-ran all my cables, I used 4 - 48" Leviton Wiring boxes and a smaller 14" box that will hold power. 1 for firewall router, ShawDirect decoder, and a channel vision video multiplexer. hand helped keep the wires in the media closet a bit easier to deal with. I knew which studs and wall top plate to have the wires drop through. I did all the terminations in the evenings and weekends AFTER all the wires had been pulled. This takes a lot of time. It took weeks of a an hour or two each evening working on terminating the network, speaker, coax, and security cables. I used Cat5 for all phone lines because it is cheap and I could also use it for other purposes if need. I ended up running Cat6 from the exterior of the house to the demark location in my media closet to ensure I would be able to have the capability of any future video of telephone wires that might show up in the future. I needed about 9 telephone drops to account for phones, security, satellite tv converter boxes. I got a small Leviton 110 punch-down board to split the line to all Voice/Phone Drop locations. I have an entrance DSL filter. I have a DSL router/modem. I have a RJ-31x line capture splitter for my Elk Security system. I have 2 surge suppressors (one older western electric and a newer suppressor for my security system. Click on the image to the right to see a bigger view of how I connected everything. I used RJ12 keystone jacks at all my drop locations. Get a compression fitting tool. You will be happy you did. Use COAX if you want to run composite video. F-type connectors (thats the normal screw on coax cable connector) have all kinds of adapters to RCA, BNC, F whaterver. You can see how easy it is for me to cross-connect a specific in-feed to a specific room/drop. 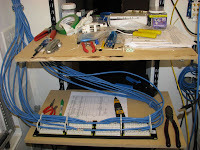 I used a 48 port 110 punch-down block which made terminating ALL my Cat6 quick. I had them all terminated in one evening. I bought 2x24 port Gb switches instead of 1x48 port switch so if one fails, I have a 2nd one to "make-do with" if needed. Cisco small business class switches. I bought a EZ-RJ45 crimper - what a time saver. (it still takes about 10 minutes to do 1 end of a CAT6 cable. Rather than making 50 30cm cables to connect between the punch-down block and the switches, I waited for a super sale at my local computer store - NCIX and bought 48. It was was easily worth the cost of connectors, and my time. My supply is a high efficiency 25A supply. It is currently supplying my firewall, WAPs and a few other things. I ran LV drops in a few different locations and I plan on using it supply as many of my wall wart supplied LV electronics as it can.